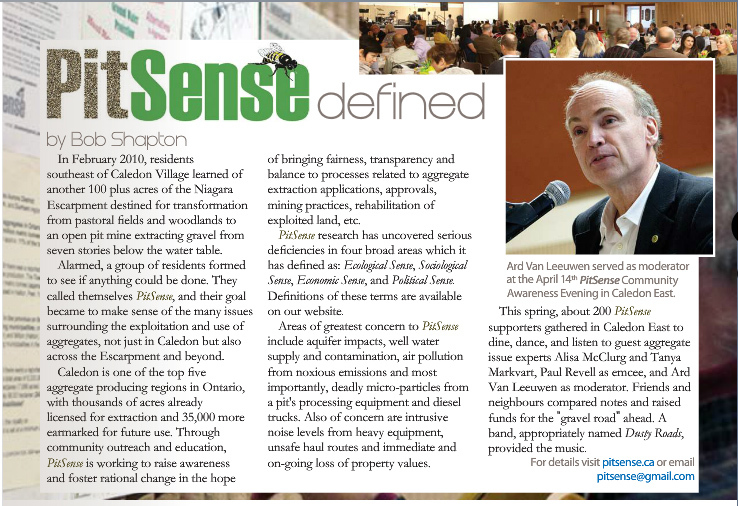 PitSense is a community of people organized to respond to proposals for further increases in the number of aggregate operations in Caledon. 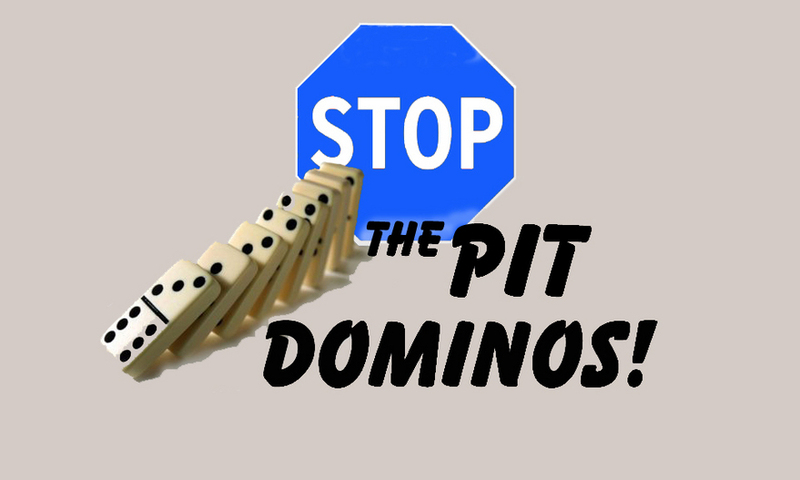 We are opposed to the continuing 'Domino Effect' growth of open pit mines and quarries in the agricultural and rural residential areas of the Niagara Escarpment and UNESCO World Biosphere Reserve. Ecology - in other words natural capital - used properly can also give you the jobs that you seek. 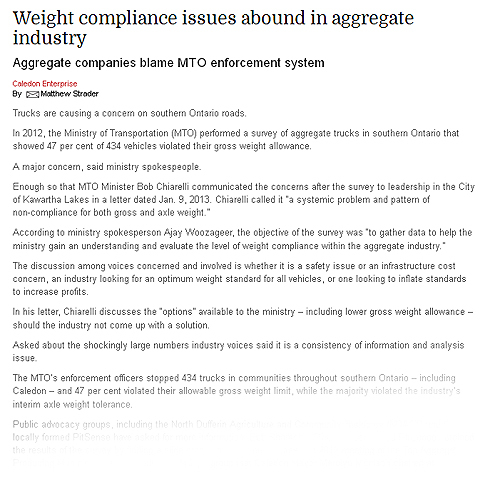 Copyright © 2010-2019 PitSense Niagara Escarpment Group Inc.
An article by Martin Mittelstaedt reports on a new initiative to make aggregate operators more responsible. Excerpts below. For full article click HERE. 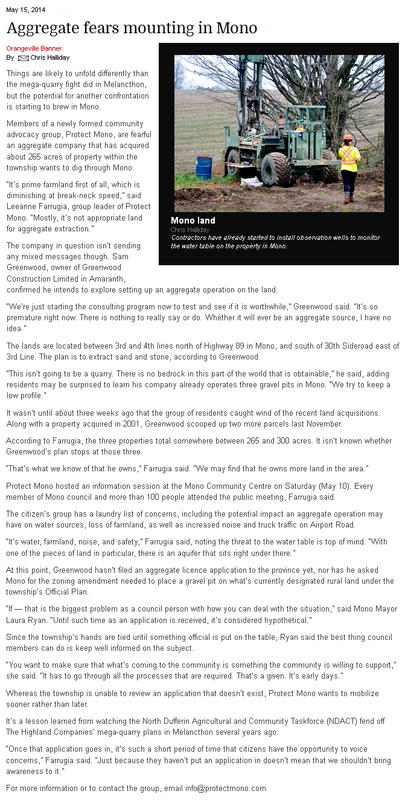 "The effort by the company is an attempt to defuse some of the vociferous opposition from community groups that typically accompanies almost all new gravel pits being proposed in Canada, and at many existing quarries." 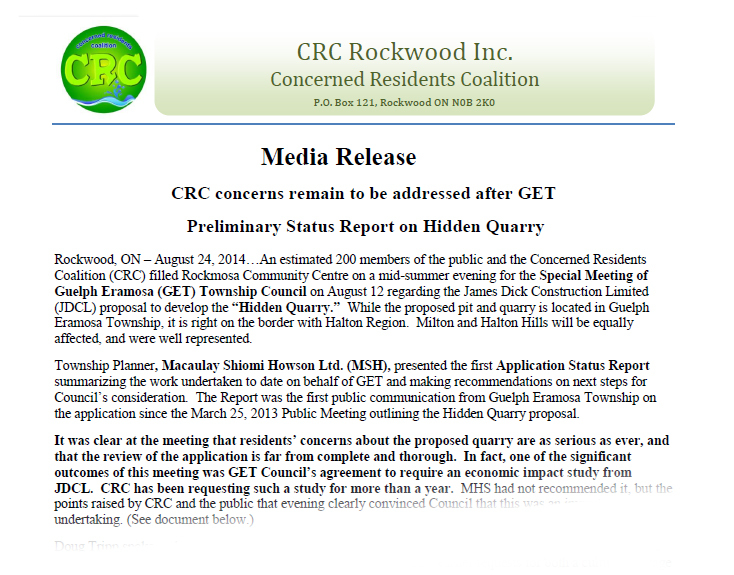 "In the past year, Ontario regulators have rejected two proposed quarries, one in the Caledon area on the outskirts of Toronto and another near Guelph." "Sustainable rocks may seem like an oxymoron, given that gravel is blasted out of open pit mines, but Mr. Galloway is convinced it’s possible, if quarries are placed in areas where the potential for environmental harm is minimized and operating practices avoid affecting neighbouring land owners." "The certification process would be overseen by an independent, non-profit entity, Socially and Environmentally Responsible Aggregates, to which all quarry operators in Canada would be able to submit facilities for evaluation." and commentary from our visitors. Also see our What's New page. CBC Interview with Ruth Grier and Bill Saunderson in which they point out that Ontarians consume 17 metric tonnes of aggregate per capita each year, while in the UK the consumption is only 4 metric tonnes per capita, due largely to aggressive recycling, substitution and conservation policies. PitSense believes Ontario must move in the same direction. 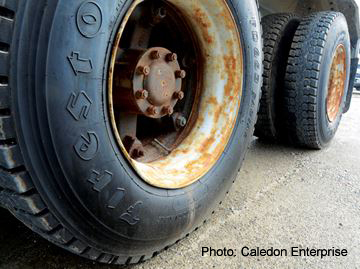 Gravel pit fight continues - "... despite concerns of increased gravel truck traffic and noise, it's the financial impact that residents may fear the most. It's a growing concern for local homeowners, especially in Conestogo, where residents say property values have already fallen since the submission of the gravel pit applications." "... nine homes are for sale near the golf course that aren't moving, one sold for more than $100,000 less than the original listed price, and a buyer backed out of a purchase at the last minute after finding out about the impending pit applications." "... agents recommend listing homes significantly below their property value." Increasingly, economists are advocating putting nature on the balance sheet ... a concept called "natural capital". On one side of the ledger, ecosystems perform invaluable services like flood control, pollination, carbon sequestration and water purification. (One estimate suggests insect pollination is worth hundreds of billions of dollars globally. The economic value of the Canadian boreal forest has been pegged at 700 billion dollars annually ... just by being there.) On the other side of the ledger, the world's top 3,000 companies do 2.2 trillion dollars in environmental damage a year according to one estimate. These costs are particularly problematic when it comes to non-renewable resources like aggregate. There are a number of prominent people working in this area - names like Pavan Sukhdev and Amory Lovins. 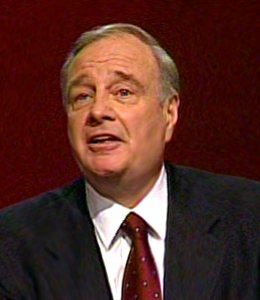 Recently former Canadian Prime Minister Paul Martin has become a major proponent of bringing natural capital on to the national accounts. Who are our elected representatives working for? "If you check the legislative documents establishing the existence and legislative authority for a government institution - i.e. the Municipal Act – on the roles of Council and the Head of Council, there is a clear definition of our elected officials’ responsibility toward the citizens of Caledon. In particular, Section 224(a) to represent the public and to consider the well being and interests of the municipality; and Section 226.1(d) participate in and foster activities that enhance the economic, social and environmental well being of the municipality and its residents. 2006, c. 32, Sched. A, s. 101. It is clear the poor operation of a strip mine and the associated failure of the Ministry of Natural Resources inspectors to oversee the license conditions negatively affects “the well-being and interests of the municipality” and fails to “enhance the economic, social and environmental well-being of the municipality and its residents”." " ... not our process, says the town. Not legally obliged to give you notice, says the ministry. And the residents are left wondering again, who is it that works for me?" "Palgrave resident Dean Williamson, who lives on Highcrest Road, south of the Tottenham pit location at Mount Wolfe Road and Highway 9, is taking his concerns to the ministry after receiving a failed water test from the Ontario Agency for Health Protection and Promotion. He’s been advised to boil his water before consuming it.."
"Gravel Watch advocate Helen Purdy believes Caledon is the victim of an ill-prepared ministry. 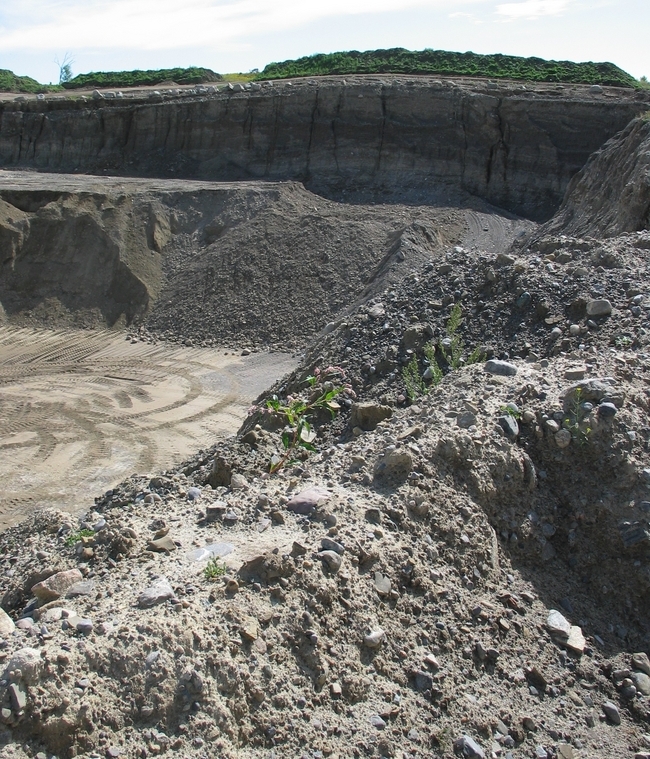 Purdy, a member of the advocacy organization that speaks for citizens’ rights concerning aggregate operations, has been monitoring and researching pits and quarries in Ontario for more than 20 years." " To say the least, I have found this process to be unsettling and the process to lack credibility. The information provided was inconsistent and many of the statements being made by the applicant lacked accuracy and substantiation. Much of the information required was not being provided." Caledon is unique on the global scale — Green, beautiful and mostly unspoiled by human activity. Melville is a lovely community on the Credit River in the Greenbelt. Caledon Council, our elected representatives, backed a plan to spoil it. February 24, 2014 - The Provincial Government released to the public the new Provincial Policy Statement that contains a surprise clause that would permit Class 3 Industrial processing of demolition debris "within operations". PitSense and 8 other community groups released a statement to the media outlining our serious concerns.